The International Herald Tribune ran an unusual article a couple days ago with the by-line 'Maybe science can save the planet: But should it?'. ""fertilizing" parts of the ocean with iron, in hopes of encouraging carbon-absorbing blooms of plankton. Meanwhile, researchers elsewhere are talking about injecting chemicals into the atmosphere, launching sun-reflecting mirrors into stationary orbit above the earth or taking other steps to reset the thermostat of a warming planet." Well, wasn't sticking chemicals in the oceans and in the atmosphere part of the problem in the first place? What really struck me, however, is that nowhere in the IHT article was there mention of the phrase 'unintended consequences' - although, at one point, the article quotes a philosopher at the American 'Center for Engineering, Ethics and Society,’ who said new technologies such as nanotechnology and robotics were so powerful that ""our saving grace, our inability to affect things at a planetary level, is being lost to us," as human-induced climate change is demonstrating." This strikes me as a bit contradictory. It looks like we are facing human-induced climate change, but this goes back to the industrial revolution and the transfer of massive amounts of fossilized carbon locked up in the earth's crust (primarily coal, oil and gas) to the atmosphere. These sources of energy certainly aren't emerging technologies - they're well established and could even be considered 'old'. Although our ancestors didn't know it way back then, they'd stumbled on planet changing technology before we even had a global view of the planet. "Stresses to the planet's atmosphere, oceans, life forms, and very surface are dramatic enough to end the Holocene epoch, the geologists say. That period began about 12,000 years ago as the last Ice Age melted and the planet warmed enough to allow people to farm and thrive." We now face the prospect of the human species "changing geologic time". But will we be around to see it? The development of weapon systems over the last century should be a rich vein of cautionary tales about the hazards of depending on technology without considering the prospect - no, the certainty - of unintended consequences. Investment in bomber forces from the First World War for so-called precision bombing contributed to massive bombing of civilians in World War Two. Carpet bombing by the U.S. and its allies in South East Asia in 1960s and 70s caused great damage to the environment, in addition to all of the human misery it caused to civilians - many of whom lived in countries not officially at war with those bombing them. The IHT article picks up on biotechnology and nanotechnology as two general areas of technological advance with big potential risks for our planet. It also notes that the ethics of emerging technologies are often not something scientists who "have their nose to the bench" necessarily think about much. This certainly matches my own experience a few years ago in working to promote the International Committee of the Red Cross's 'Biotechnology, Weapons and Humanity' appeal to practitioners in the life sciences, in order to prevent their hostile misuse. There has been some modest awareness-raising since then, and states parties to the Biological Weapons Convention have given official focus to it, in addition to the good work of many national scientific academies and medical associations. But synthetic biology, in particular, is one likely area full of difficult ethical dilemmas. The biggie for the present though is nuclear technology. The scientists involved in the Manhattan Project believed that were developing a weapon to win the Second World War, and many hoped nuclear technology would then be turned to peaceful purposes. Few were likely aware that it would became the basis for a Cold War arms race in which the effects of nuclear war would truly have world changing consequences because each side would deploy tens of thousands of warheads each. Richard Rhodes' book Arsenals of Folly discusses how the design of the reactors installed in Chernobyl was compromised by the demands of the Soviet Union's military programmes. The RBMK reactor was originally a production reactor developed in the 1950s to produce plutonium for nuclear weapons - a factor that meant it was chosen rather than the safer VVER light water reactor design to be adapted for civilian power operation in the 1970s. Rhodes also relates how, in 1986, the Soviet Union's new leader Mikhail Gorbachev was aghast when the scale of the human, environmental and economic consequences of the Chernobyl reactor accident finally sank in - and horrified at what would happen if these facilities became deliberate targets in war. Yet the Chernobyl explosion, fire and radiation were only fractions of the damage nuclear weapons could do. The road to hell is paved with good intentions and perhaps more than a few handy-sounding inventions. Responsible policies are needed to tackle global challenges, and not just new technologies - and that means thinking further ahead than the next election cycle, a hard thing for politicians to do. Richard Rhodes, Arsenals of Folly: The Making of the Nuclear Arms Race, London: Simon & Schuster: 2008. NASA image AS8-14-2383 ("Earthrise") taken by Apollo 8 astronaut William Anders on 24 December 1968, and downloaded from Wikipedia.org. 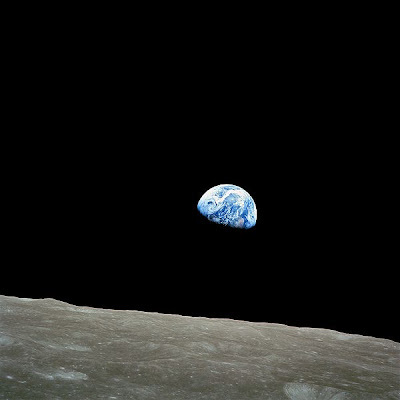 "Earthrise", although now almost visual cliché has been described as "the most influential environmental photograph ever taken." Earthrise is sometimes confused with a December 1972 photograph taken by Apollo 17 astronauts taken of the brightly lit face of the Earth from 29,000 kilometres ("The Blue Marble").